More languages and new digital formats and a new design: Deutsche Welle starts its ninth annual, international blog and social media awards, the Bobs, on February 6, 2013. Internet users around the world will have until March 6 to submit their candidates for the Bobs in 14 languages. For the first time, Hindi, Turkish and Ukrainian will be official award languages. The Bobs also added the "Best Person to Follow." Criteria for the new category are relevance, influence and interconnectedness. Anyone who would like to take part can find all the details at www.thebobs.com, which underwent a major redesign for 2013. An international jury panel as well as an online vote will decide the winners of the Bobs 2013. The 15-person jury will select winners in the six multilingual categories, and it will be up to Internet users to choose their favorite nominees in all 34 categories. Last year, more than 3,000 sites were submitted to the contest and over 60,000 ballots cast online. The "Global Media Forum Award" this year will cast the spotlight on the focus of this year's Deutsche Welle Global Media Forum (June 17-19 in Bonn): "The Future of Growth - Economic Values and the Media." The award ceremony for all the jury award winners will take place during the conference on June 18, 2013. In cooperation with the human rights group Reporters Without Borders, the Bobs will once again bestow the "Reporters Without Borders Award" to an Internet project that sets itself apart by promoting freedom of the press, expression, democracy and human rights in an exemplary manner. Deutsche Welle created the Bobs in 2004 to stimulate and enrich a public discussion about freedom of expression in digital media. 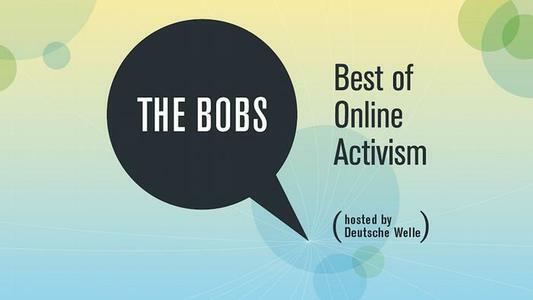 Over the last nine years, The Bobs have honored projects from around the world that stand for integration, transparency and which help Internet users move through the language barrier for a view of the global digital community. "The Bobs awards give people courage to push forward with their democratization and participation efforts," said Ute Schaeffer, DW Editor-in-Chief for Regionalized Content. This is the place for the blogs whose content and design do an exemplary job of promoting and protecting human rights as well as initiating and fostering open discussion of topics that are of social and public importance. A software solution, application or Internet platform that dedicates itself to providing the technology that enables people to improve society and democratic social integration. An initiative that makes exemplary use of social media, networks and other forms of digital communication to bolster democracy, freedom and human rights. 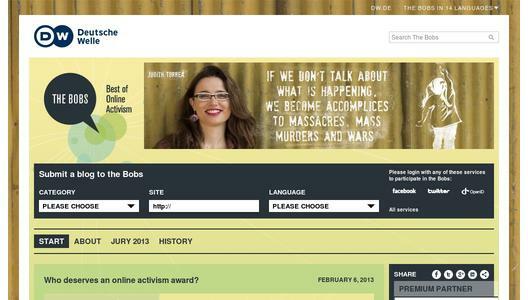 For websites that take a creative and entertaining approach to serious topics. The focus here is on the innovative and surprising way socially relevant topics are handled and presented. For projects that take a strong stance for freedom of information and expression around the world. It also honors bloggers who dare to spread information under daunting circumstances. For websites that address the focus of the 2013 Global Media Forum: "The Future of Growth - Economic Values and the Media." The Best Blog categories will honor sites in all 14 languages that play a role in promoting public dialogue and providing top-quality analysis and commentary on current events. The Bobs' official contest languages are: Arabic, Bengali, Chinese, English, French, German, Hindi, Indonesian, Persian, Portuguese, Russian, Spanish, Turkish andUkrainian. The best microblogs in each of the The Bobs' 14 languages. We'll be narrowing the field down to the best microblogs dealing with current events. Important criteria are relevance, influence, interconnectedness and original content. This category is open to individuals as well as accounts run by companies or fictitious figures. - The Bobs start on February 6 and will be open to site submissions until March 6. Jury members will then choose their nominees for each of the categories. A complete list of jury members can be found at www.thebobs.com. - Between April 3 and May 7 all the winners will be chosen. The jury panel will meet in Berlin to discuss and select winners for the jury awards and - independently - the Internet public will be able to cast their votes for the sites and projects that most impressed them. - All the winners will be announced on May 7. - On May 3, jury members will hold a press conference in Berlin on the trends they observe in social media use in their own countries. - The winners of the six main, multilingual jury awards will be invited to Bonn, Germany, to receive their awards as part of the Deutsche Welle Global Media Forum. Our premium partner is Reporters Without Borders. Media partners are Masrawy, Somewhere in..., Bdnews.com, iSUN TV, Global Voices Online, Categorynet, Courrier International, Presseeurop, Gooya, Korrespondent, ntvmsnbc, MYNET, MEDYATAVA, webdunia, Terra and Lenta.ru.